Hello there and welcome back to my blog for another spotlight post. Today I am featuring one of my favourite Sale-a-Bration sets that I am going to be so sad to see go and that is Epic Celebrations. I absolutely LOVE the youthful images and aren't they just great for teen cards? My gorgeous partner Declan plays guitar so I always think about him when I am looking at this stamp set, as it's Declan all over. When looking at this stamp set that first thing I think of is how great it is for both teen and masculine cards. With images like guitars, sneaks and headphones, it's perfect! 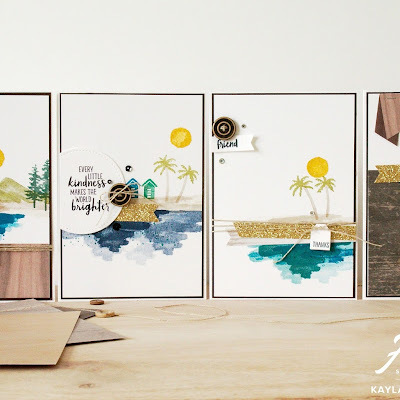 That's the vibe I went for when creating the below cards and combined it with another lovely Sale-a-Bration product, the Bubbles & Fizz Designer Series Paper. Did you know that Sale-a-Bration is ending in just a couple short weeks? Time is running out to earn FREE products. Check out my shop here if you want to know more about it. 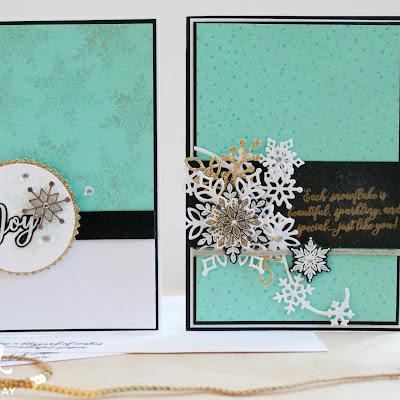 Here's a look at the two cards I made using my two absolute FAVOURITE colours, Lemon Lime Twist and Bermuda Bay. 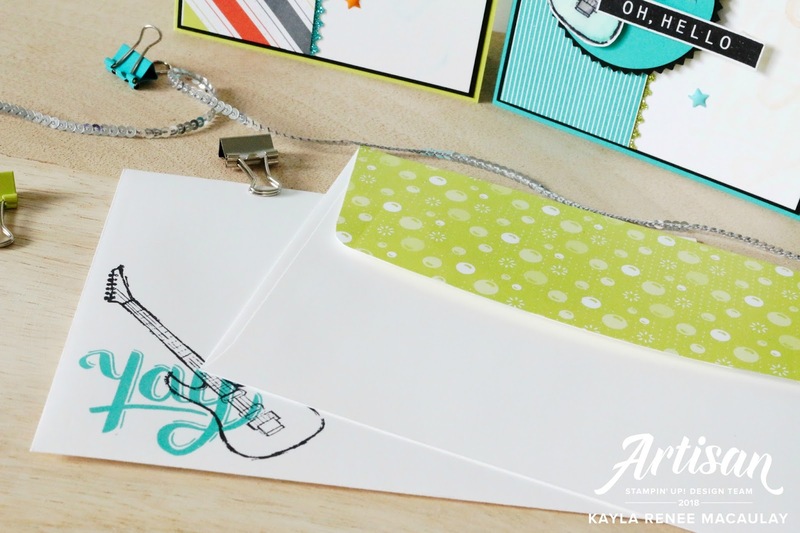 I knew that I wanted to use both the guitar and sneakers and so I got out my favourite Stampin' Blends and had some fun colouring them with a mixture of the light and dark tones. 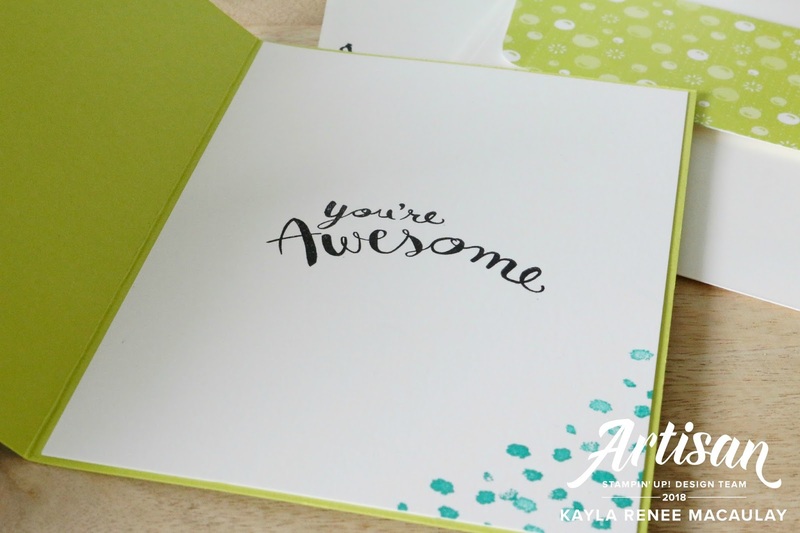 I also gave my brand new Stamparatus a work out with the Great Big Greetings stamp set to get a ombre 'Yay' sentiment down the side of the card on the white panel. This is called the 'hinge step' technique and is fabulous for creating ombre effects and repeated stamping. Of course I did my usual and decorated the envelopes to match with some stamping and coordinating Designer Series Paper. I can't leave any envelope alone these days. Here's a close up of my guitar card. 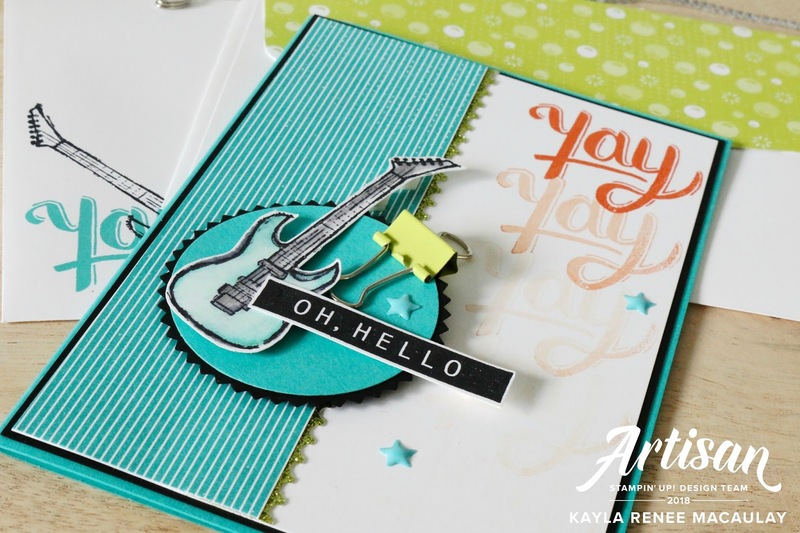 As you can see there is an 'Oh, Hello' sentiment there which is actually from the limited edition Colour Me Happy stamp set, you can find that linked below! And a close up of my Lemon Lime Twist card. As you can see I have used the Starburst Punch in basic black and layered a coloured circle on top. Did you know that the 2'' circle punch is a perfect coordination for the Starburst Punch? Works perfectly and so easy and quick for a circle to layer on! 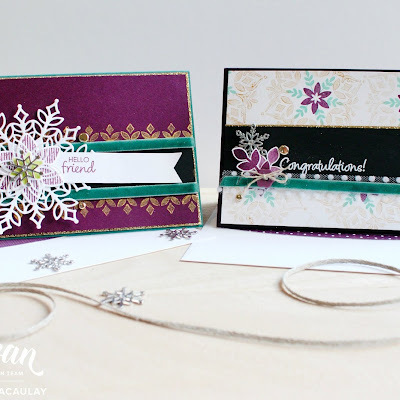 Here's a quick look at how I decorated the inside of my cards, quick simple and easy! I hope you enjoyed this quick look at my teen cards today and I am pleased to have these on hand for the next male or teen birthday that comes around.